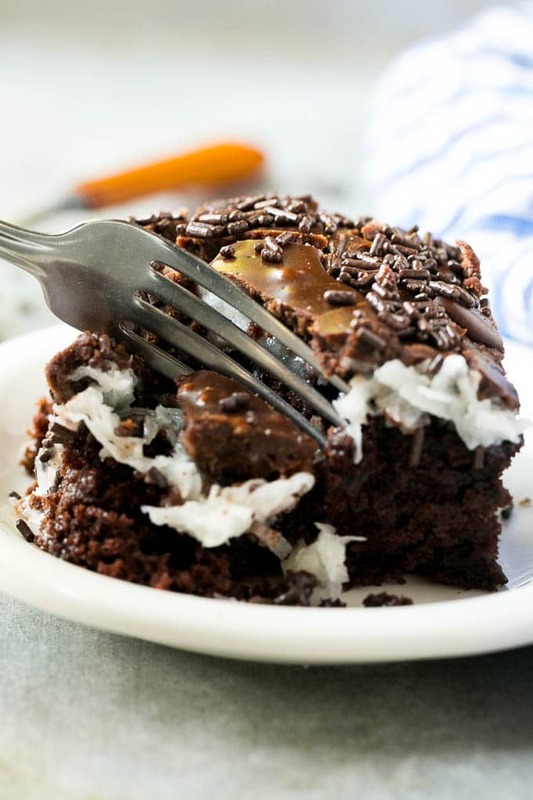 This decadent chocolate coconut cake recipe is topped with a creamy coconut marshmallow sauce and finished off with a layer of chocolate frosting. My husband’s absolute favorite cake! If you’re a chocolate lover, you’ll most definitely enjoy this cake. It’s loaded with different flavors and textures and is a unique addition to any celebration. Looking for more chocolate recipes? Try my brownie pizza and chocolate pudding cake. I started making this chocolate coconut cake years ago when I first learned to cook. I’ve adapted the recipe over time and can confidently say that if you’re a coconut fan, you will love this cake. My husband asks for this cake every year for his birthday, he can’t be swayed by the pretty pictures of other cakes I show him in magazines or on Pinterest. He’s declared this one to be his favorite. How do you make chocolate coconut cake? This chocolate coconut cake starts with a single layer of chocolate cake. But no one’s that excited by a plain, unadorned piece of chocolate cake. It’s the coconut sauce that makes this one special. When you melt marshmallows with a little milk and sugar and add coconut to the mix, something really magical happens. 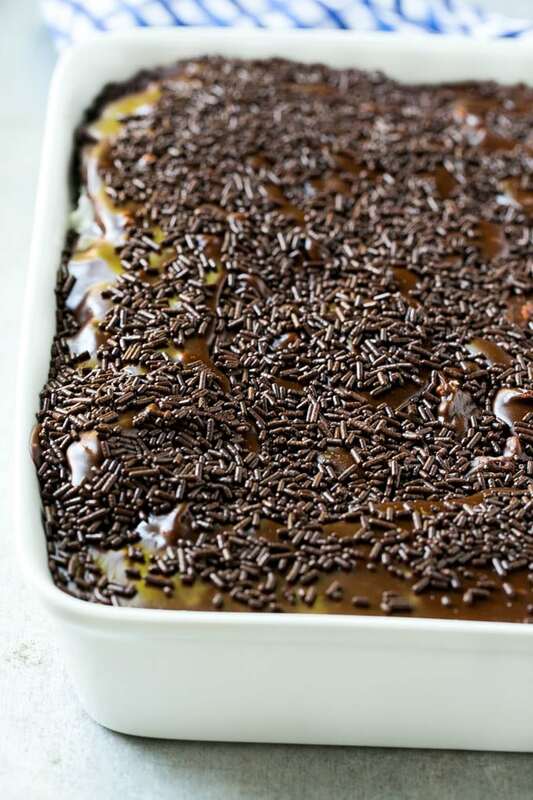 It forms this thick and creamy sauce which then gets spread over the cake. The sauce firms up as it cools, which means it won’t run all over the place when you cut the cake. The final touch is a layer of chocolate frosting that gets poured over the top. 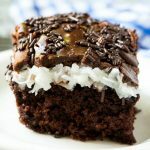 The cake is pretty straightforward to make – the one thing I want to mention is that the chocolate frosting is almost like a really thick glaze. It’s best to pour it evenly over the top rather than spread it with a knife, because as it cools it will not spread smoothly. To get a nice glossy coating like in my pictures, pour it and then don’t touch it again! Whether you’re celebrating a birthday or just want a sweet treat to serve after dinner, no one can ever turn down a slice of cake. This chocolate coconut cake is the perfect all-occasion treat! Or in my case, the perfect annual birthday treat for my husband. This post was originally published on July 9, 2015 and was recently updated with new photos and recipe instructions. 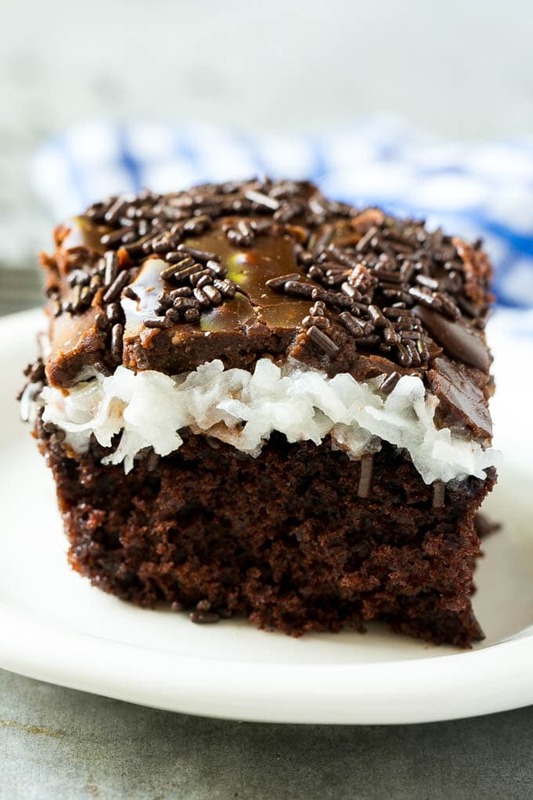 This chocolate coconut cake features a layer of rich chocolate cake topped with a creamy coconut sauce and chocolate frosting. 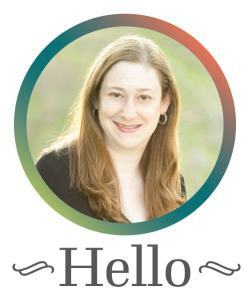 Adapted from All Recipes and Cooking Light. For the cake: Coat a 9"x13" pan with cooking spray. Prepare the cake mix with the oil, eggs and water in amounts as directed on the box and bake according to package instructions. Cool completely in the pan. For the coconut sauce: Combine milk, sugar and marshmallows in a medium saucepan, cook over medium heat for 5 minutes or until the marshmallows are melted. Stir in coconut and cornstarch, bring to a boil. Cook one minute, stirring constantly. Remove from heat and pour the coconut sauce over the cake while it's still warm, then let cool completely before you add the frosting. For the frosting: Melt butter in a small, heavy saucepan over low heat. Add granulated sugar, milk and cocoa powder, cook for 2-3 minutes or until mixture is thoroughly combined. Remove from heat and cool slightly. Stir in powdered sugar and vanilla. Pour over the cake. Add the sprinkles on top while the frosting is still warm. Do not try to spread the frosting with a knife or it will not set properly. Make Ahead: The entire cake can be made a day in advance. Hello, making this cake today, a day in advance of my husband’s birthday. Do I put it in refrigerator once it’s done or leave it outside? I typically refrigerate it, you may want to leave it out for about 30 minutes before you plan to serve it. I just made this cake but I made it into a poke cake with homemade chocolate pudding. It’s in the fridge right now cooling, so I hope it turn out yummy! Update: so good!ots going to be hard. Otnto eat the whole thing by myself! Making this lovely cake for Fathers Day! I have some dads who are coconut and chocolate lovers. Don’t think I can go wrong! I’m not usually a huge chocolate cake person, but THIS one…..is a different story! I promise you’ll like it! Yumm! So many delicious flavors in the one cake. Must have a slice (or five)! That marshmallow sauce does sound magical. I don’t only used the store bought creme so I’m intrigued! This cake looks AMAZINGGG! I am a huge coconut fan! Pinned! Can’t wait to try this one out! Oh my goodness! I can see why your husband loves this cake! I am raising my hand so high right now! I love anything with coconut, chocolate and marshmallow!